DNS is fundamental to everything that happens on the Internet. From visiting a website. opening a file or sending an email, DNS is the cornerstone to how your customers engage with your online presence. 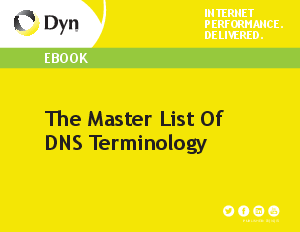 Whether you are a seasoned expert or just beginning to look into how DNS can improve the performance of your businesses’ services, let this quick guide to DNS terminology be your comprehensive one-stop shop. Retain your loyal customers with a consistent end-user experience.